Kinder Surprise Eggs Are Coming To The US! Legal and All! They’re here! They’re here! Just in time for Easter, Kinder Surprise Eggs (Kinder Ueberraschungseier) are finally making their debut in the US market. Who has not had Europe-envy and smuggled this candy into the country? As I am from Germany, I can tell you that they are MY son’s favorite. There is no visit to Germany with an over-abundance of surprise eggs. Finally, after almost a century of waiting, the US has decided to lift its ban on these horribly dangerous eggs. 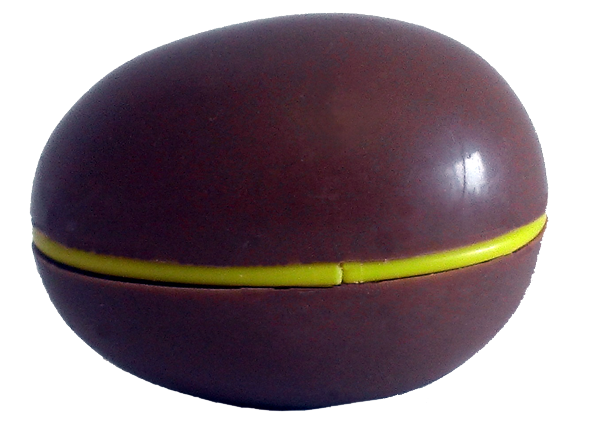 Since 1938, the government has been afraid of kids dying from eating the toy inside the chocolate (because all kids and parents can swallow an entire egg as big as the palm of your hand, complete with a hard yellow plastic egg no problem). So if you were audacious enough to bring one of these eggs with you to the US, you could be fined up to $2,500 per egg. And it HAS happened. Bringing a chocolate egg into the country… man, it’s been a federal offense! Fast forward 75 years, we are still not free to bring them here, BUT we can buy a slightly modified version of the chocolaty goodness in eggform! Starting this Easter, available at every major retailer, including Target, we get to buy Surprise eggs where the chocolate halves are separated by a small yellow plastic ring. This ring clearly marks the fact that there’s a surprise inside the halves. So clearly, no one will swallow and die from the toy now. No matter, we have Surprise Eggs! They are not in their usual branding, so memorize the picture above and look for that (think Milka colors). Called CHOCO TREASURES, they come in 3 different editions. The eggs and the toys are themed. They feature the original version, sports balls and Spider Man, licensed by Marvel. So watch out folks! Kids or not – Surprise Eggs are coming. CHOCO TREASURES!! Wow, this seems great news to all Kinderüberraschungsei-lovers. One of the first things I do when I’m visiting Germany is go to the local Tengelmann to buy one! 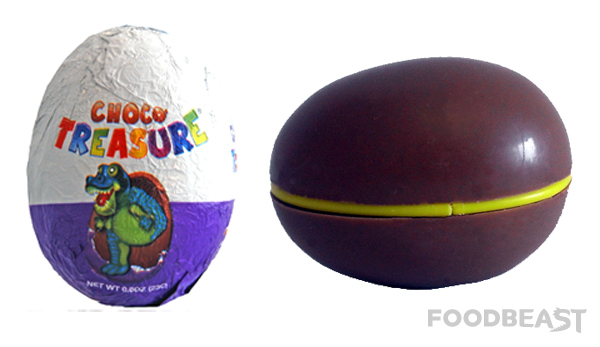 I dug around online to read more and discovered these eggs are made by Candy Treasure, a NJ company with no direct or licensed relation to Ferrero (maker of the Kinder eggs). So while this may be better than no Kinderei at all it’s not Kinder chocolate or a Kinder toy inside. I haven’t seen them in stores and am curious how they taste compared to Kinder. Good research! I haven’t seen them either and been disappointed after all the hype.